Pop quiz. 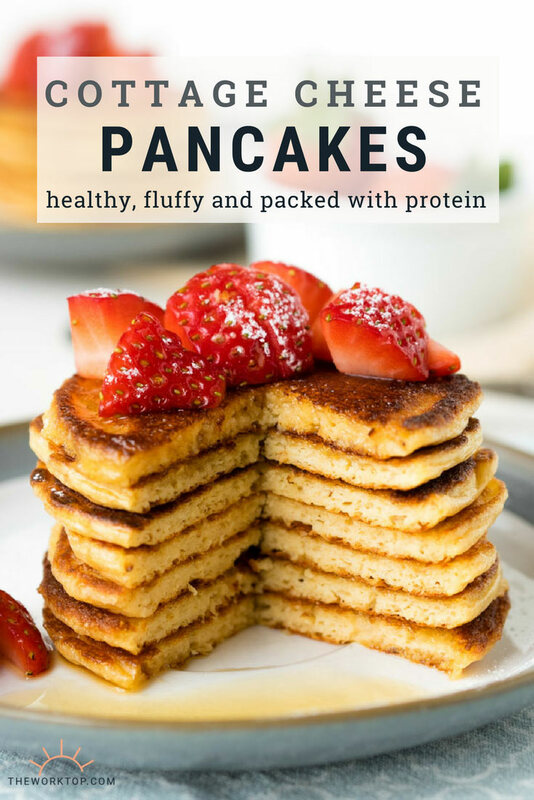 How do you make healthy pancakes and keep them yummy? There are probably a million answers. 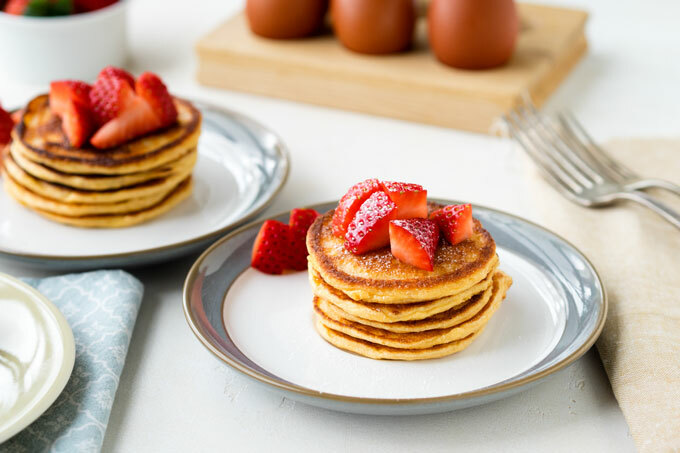 But one delicious (and easy) way to make pancakes that are healthy is to follow this simple Cottage Cheese Pancake recipe. Cottage cheese is a great ingredient that is rich in calcium, protein, and various vitamins. If you are looking for cottage cheese recipes that are healthy, you’ve come to the right place. This Oatmeal Cottage Cheese Pancake recipe is nutritious, filling and will give you a great start to the day. 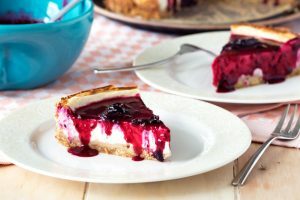 And if you would like another healthy cottage cheese recipe to make after this recipe, I highly recommend Healthy Cottage Cheese Cheesecake. 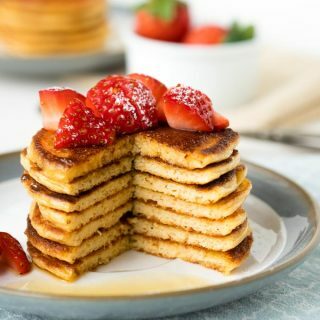 The texture of these simple Cottage Cheese Pancakes is simply perfect, and you would never be able to guess that this is a gluten-free pancake recipe. They cook light and have the trademark fluffiness of any good pancake recipe. These pancakes keep their springy quality with the help of the eggs. (You’ll also notice that the pancakes in my photos are yellow; I used a really good egg with a rich yolk to give it that hint of color.) But the springiness also comes from whizzing the mixture together in your blender (or stick blender), whichs adds a bit of air to the batter. The quick cooking time and flexibility of this Oatmeal Cottage Cheese Pancake recipe makes it suitable for breakfast, lunch, snack or dinner during any day of the week. 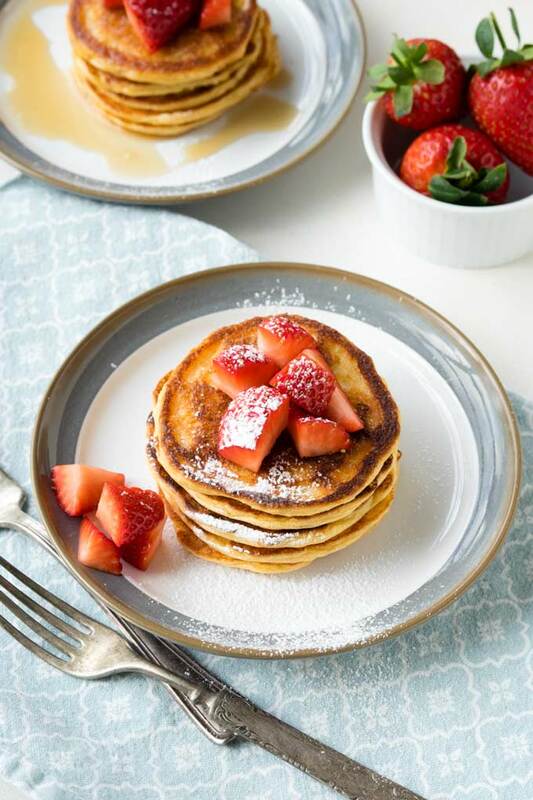 Pairing these cottage cheese pancakes with maple syrup and strawberries (and whipped cream!) 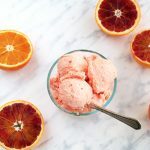 will make for a delicious indulgent weekend brunch. Or make the recipe more utilitarian and savoury for a weekday breakfast by not adding toppings. As all the main ingredients (egg, cottage cheese, and oats) are hearty, these cottage cheese pancakes are filling and can also be served as a side at dinner. This is a true family friendly cottage cheese pancake recipe – healthy, delicious, easy to make, and versatile. 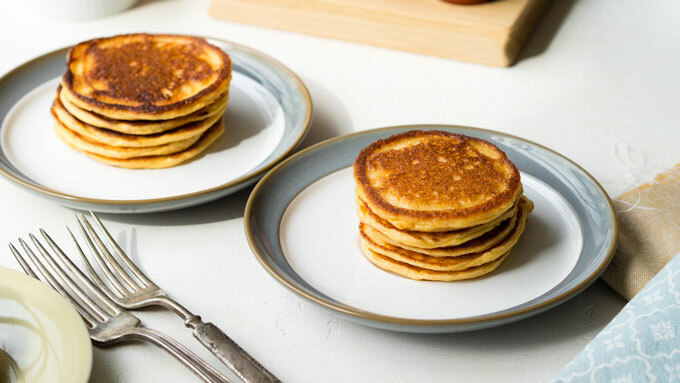 This Oatmeal Cottage Cheese Pancake recipes makes 15 small pancakes, which will serve two hungry people, plus a toddler. Or this recipe can feed two very hungry people. 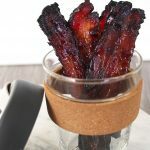 Or FOUR people if you add on a side of Maple Glazed Bacon or a healthy green smoothie. 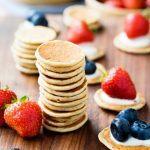 For parents with babies or toddlers, the firmness of these Oatmeal Cottage Cheese Pancakes make them ideal finger foods. 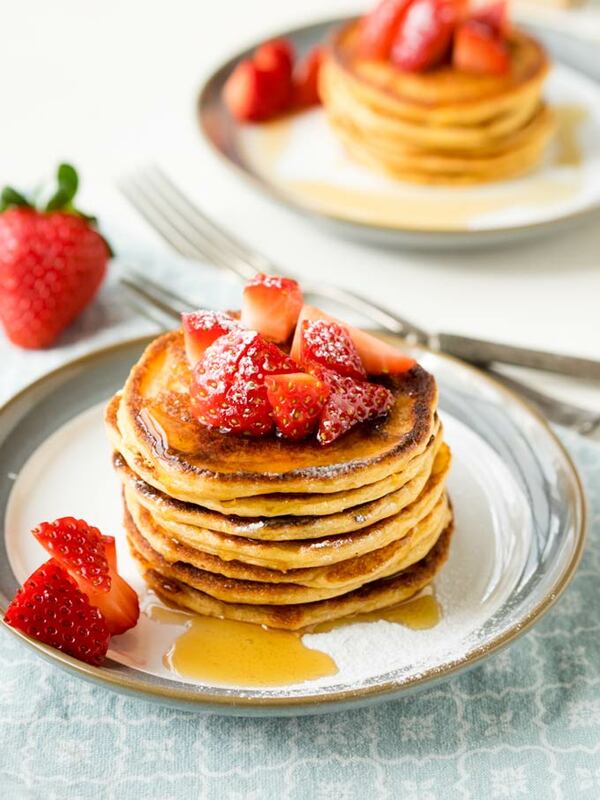 There is also no sugar added in this pancake recipe, and it’s made with protein rich ingredients. 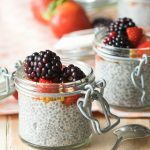 So you can be sure your baby or toddler is getting a healthy breakfast. You may notice the batter thickens as you get to the end of the batch (this all depends on how long it takes you to cook them). That’s because the oats soak in some of the liquid, so you shouldn’t need to worry. But if you prefer, you can add a teaspoon of milk or water to loose up the batter if it becomes too thick. Give the batter a quick spread with the back of the spoon if it becomes too thick on the pan when you drop the batter on. Flip the pancake when the top has several bubbles and starts to look dry and shiny, and the bottom is a golden brown color. If you have any questions, feel free to ask below. Hope you enjoy! 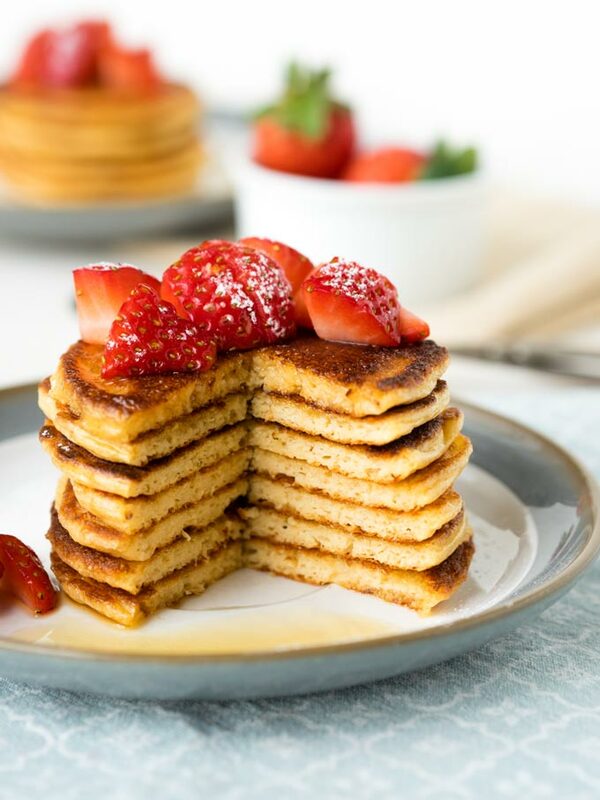 A healthy and delicious recipe for Oatmeal Cottage Cheese Pancakes. These simple cottage cheese pancakes are fluffy and light, and the perfect breakfast for the entire family. 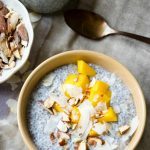 The recipe contains oatmeal, cottage cheese, and eggs for a protein rich and filling breakfast. 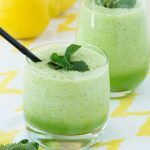 Add all the ingredients into a blender and blend until smooth. Alternatively, add everything into a bowl and use an immersion blender and blend until smooth. If you do not have a blender you can mix it by hand, however the pancakes will not be smooth. Lightly coat a large non-stick skillet or griddle with a bit of oil, then heat over medium to medium-high heat. Working in batches, spoon about 2 tablespoons of pancake batter onto the pan for each pancake. Gently and lightly use the back of the spoon to guide the pancake batter so it spreads out into a 3-inch diameter round. Make sure to leave room between pancakes so you can easily flip the pancakes. Cook on one side, until the top begins to look set with some bubbles, and the bottom is golden brown, about 2-3 minutes. Flip the pancakes, and cook until golden brown on the bottom, about 2 more minutes. Transfer to plates, top with desired toppings, and serve. These simple cottage cheese pancakes can be served plain, sweet or savory. 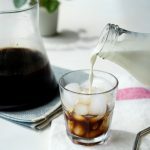 LOOKING FOR MORE COTTAGE CHEESE RECIPES? I made these today & loved them! A had them with smeared sweet potato, crumbled hard sheep’s cheese & some rocket salad – amazing!! Thanks for the feedback, Jean. Happy you love the pancakes! 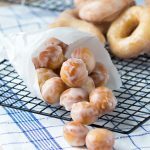 Can you save the batter for the next day? Good question! I haven’t tried that before. If you do, mix in the baking powder in in the morning. Also, you may need to add a tad of liquid (milk?) in the morning because the oats will have absorbed some of the liquid. What a wonderfully unique recipe! 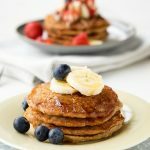 I would never have thought to make pancakes using cottage cheese and oatmeal…love it! Also love that it’s gluten free! Mmm these pancakes look amazing. Thanks for sharing! 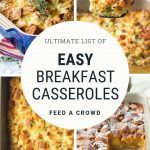 We often do Breakfast for Dinner, and these would be a great option for that. A little more protein, a little fewer empty carbs. I wouldn’t have guessed there was cottage cheese in them. They look delicious!